One of the colonists' chief concerns was defense. 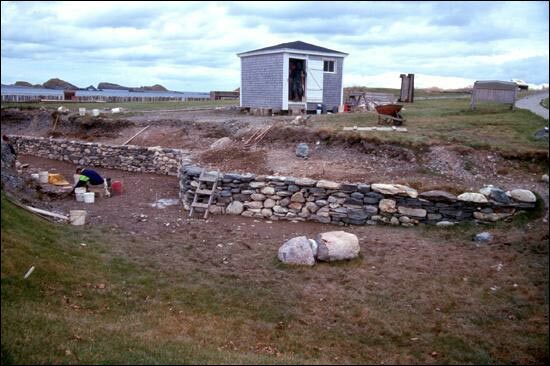 Captain Wynne, the first governor, reported that he had "thrown up a face of defense to the waterside ward, with earth digged from the cellar and kitchen...". 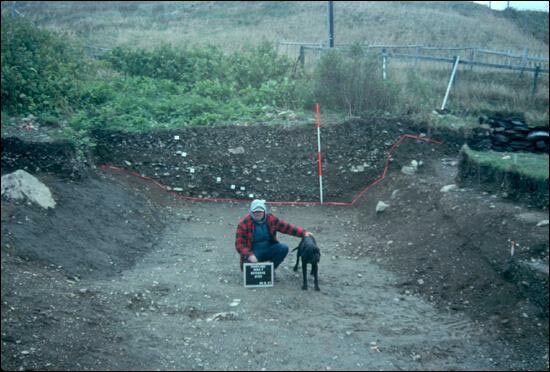 Part of the defenses included this ditch, about 20 feet wide and 4 feet deep. Shown here is a profile through the ditch. The image below shows the defensive ditch looking south. The stone scarp of the rampart can be seen at the right of the image; the counterscarp, or outer face of the ditch is at the left. 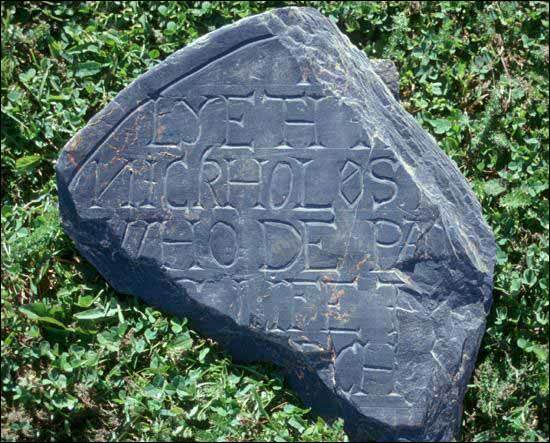 The image below is the restored stone facing of the counterscarp. This image is looking north. A counterscarp is the outer sides of a ditch or moat used in fortifications. 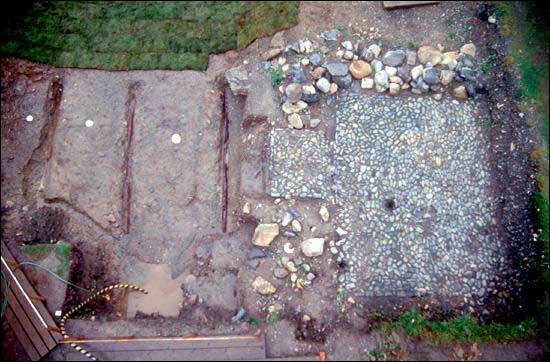 The ditch can be dated to the early years of Avalon by a number of artifacts found in the very lowest layers. 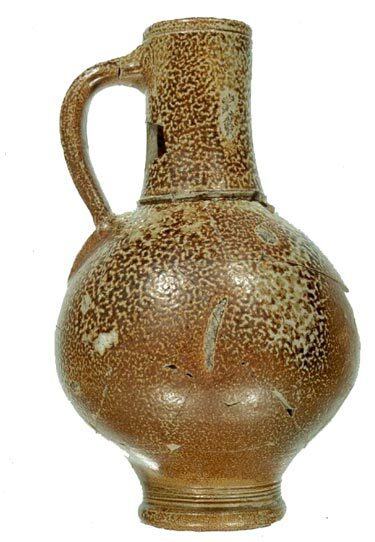 Among these artifacts are an undecorated German stoneware jug made sometime between 1575 and 1625 (1st image below), and a large fragment of a gravestone, possibly that of Nicholas Hoskins who was at Avalon during the winter of 1622/23 (2nd image below). 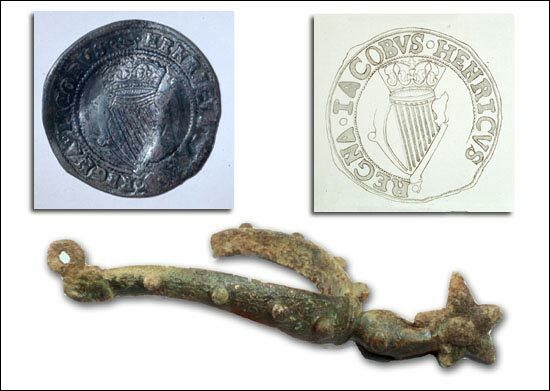 Also found in the lowest layers of the ditch were an Irish silver shilling from the reign of James I and a gold-plated brass boot spur. 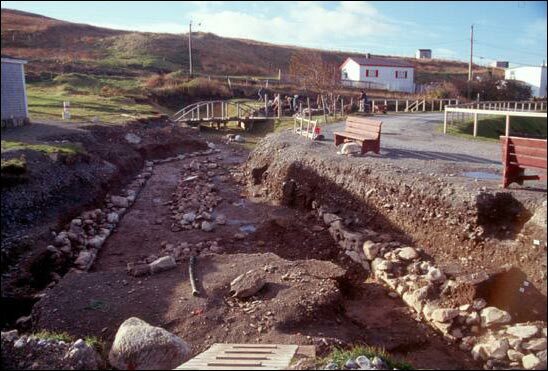 The following image shows the sills remaining from a bridge that crossed the defensive ditch and led from the village to the Ferryland Downs to the east. 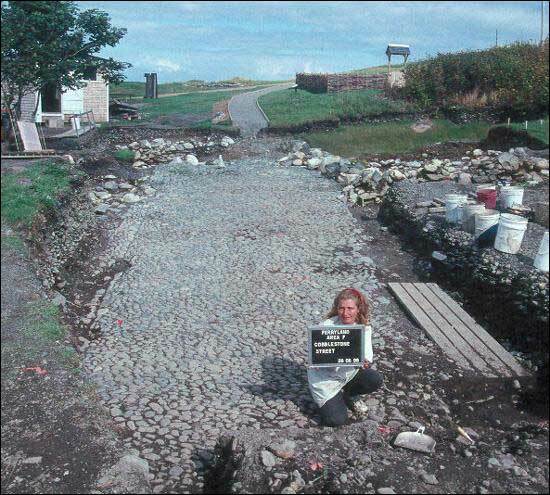 To the right can be seen the location of the east gate to Avalon and the east end of the cobble pavement that seems to run through the entire settlement. The cobblestone street leads westward from the east gate for some 400 feet. Although it seems to make a number of turns and bends along its course, the west is the same width - 13 feet - as the eastern end.